A Green Light-infected person is shot by the police. The master of metal is dressed up in a costume with hopes to be a superhero. Jefferson agrees to let Anissa and Jennifer take up the mantle of being superheroes if they agree to a code: (1) don't tell people their identities, (2) don't go in without backup, and (3) no murder. Jennifer is hesitant because she wants to kill Tobias. Agent Odell uses his cameras to watch out the Pierces. Dr. Jace, Cutter and Tobias awaken the three remaining MODs: Darryl, Joe, and Rebecca. "Cape Guy" was the metahuman high on Green Light. A news report shows that people were worried for him; they're mad that the police killed him. Dr. Jace thinks she can awaken the pod kids within a week or two. Gambi makes the connection between Todd Green and Tobias. Gambi is going to study the wind speed to determine the radiation trace in the city to find the criminal metahumans. The reanimating doctor was an old friend of Lady Eve. He agrees with Lala that Tobias needs to be killed. Jennifer tests out her powers in her pre-suit; the trial proves successful. 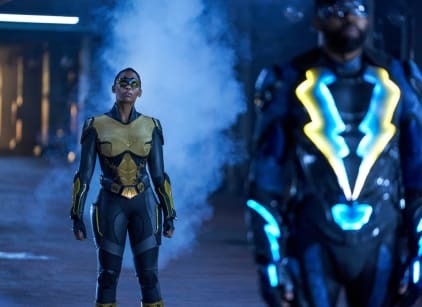 Jefferson experiences a memory of raising Jennifer, from them moving into the house to her seeing him in post-Black Lightning battles. Jennifer tries to change Jefferson's mind about not killing Tobias. He doesn't bend to the argument; he thinks it's a bad idea. Gambi thinks the man that Anissa found in apartment was a shapeshifting metahuman. Lynn plans to introduce Wendy to Perenna for some therapy. Wendy is afraid of going back into society since her entire life has changed. Lynn comforts her and gives her hope for the future. The reanimating doctor gives Lala a gun for his fight. He reminds him of his power: that Lala won't ever die until he fulfills his mission. Tobias wants to train one of the MODs to fight against Black Lightning. The metahuman refuses and tries to hit Tobias. Cutter slits his throat, but the wounds aren't fatal. Lynn asks Jennifer if she would talk with Wendy about being a teenager with metahuman abilities. Agent Odell listens in on their phone conversation. Cutter, Dr. Jace, and Tobias plan to send Joe for their secret mission. Agent Odell tries to take Wendy, but Lynn stands up to him and demand that she stays. Agent Odell agrees and walks away. Anissa remembers Grace's glowing eyes; they're similar to the man she fought earlier. She thinks that Grace ran away because she's a metahuman. Joe (a firestarter) causes chaos in downtown Freeland. Tobias records the damage and puts an ad on the dark web to sell his metahumans to the higest bidders. Joe breaks up Councilman Parker's ceremony. He sets the Councilman on fire and kills him. Black Lighting and Joe fight in a parking garage. Joe lights up the gas pipes. Thunder joins the fight, but Tobias sends Joe to retreat. Jennifer uses her powers to discover the origin of the radiation. Dr. Jace makes a case to Tobias about working together since they balance each other. Tobias refuses as he wants to work with Cutter. Lala breaks into Tobias' secret lair. Cutter throws several blades at him, but Lala survives the attacks. Cutter, Dr. Jace, and Tobias make a run for it. The neighborhoods are cleared in the Pierce home. Jennifer, as Lightning, tries to kill Tobias, but her plans fail as the power becomes too much for her.